Problem: Visual NLP techniques such as the Map Across technique and the Fast Phobia technique rely upon the generation of realistic images within the imagination and associating specific feelings with each image at the same time. However, most people have difficulty imagining images and associating into specific feelings at the same time. It is also easy for therapists and / or their patients to become confused by the process itself. 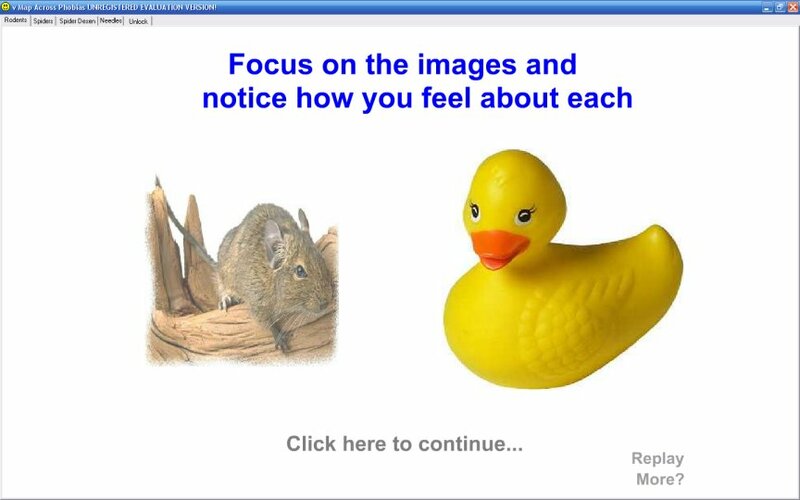 Solution: Our software based approach addresses these issues by providing appropriate images on-screen that can either obviate the need to imagine anything at all, or makes the generation of mental imagery much easier. Relevant sounds enable feelings to be assoicated into much more easily. Onscreen instructions guide therapists and their patients through the process to reduce confusion. We provide a number of specific phobia solutions and enable you to provide your own images so you can treat non-standard phobias. For patients: Overcome your fears and phobias quickly and easily using proven Neuro Linguistic Programming (NLP) phobia treatment techniques. For therapists: Bring NLP treatment of phobias to life and show your patient's exactly what to imagine using this highly visual, multimedia approach. 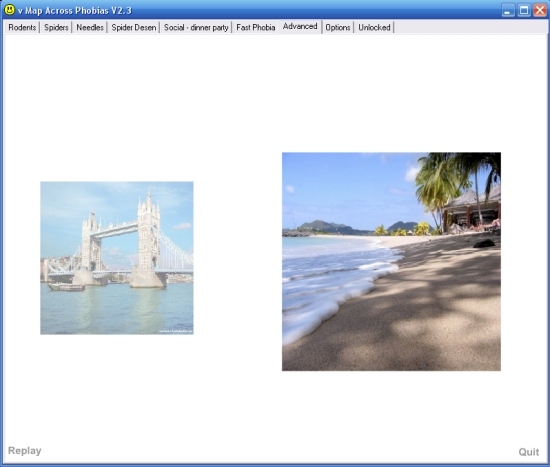 Sample solution images for use with the advanced Map Across module include: beach / teddy bear / clouds / duck / flowers/ kitten / mountains / sunset. The NLP Map Across Technique maps the submodalities of something that is feared into the submodalities of something that is not feared at all or visa versa. The technique can be used to install aversion or to enable desensitisation. Detail: The software utility repeatedly associates an image of eg a spider with an image of a rubber duck. For example: As the spider moves to the horizon and back again "swish / whoosh" sounds are played. 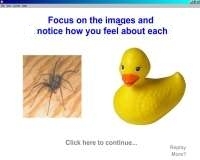 As the spider image is overpowered by the duck image (the duck image merges with the spider image as the spider image fades out) "duck quacking" sounds are played. 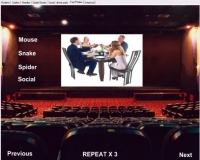 The Fast Phobia Technique is a multi stage dissociative desensitisation technique using a cinema theatre as a metaphor. Desensitisation is also potentially facilitated by merging humour with the rapid rewind part of the process. (See below for details). What does the NLP Map Across phobia / Fast Phobia technique treatment software utility do? Map Across technique: The modalities of the safe object are amplified, the modalities of the feared object are minimised, the feared object is mapped on top of the safe object as left to right matching auditory stimulation is provided. 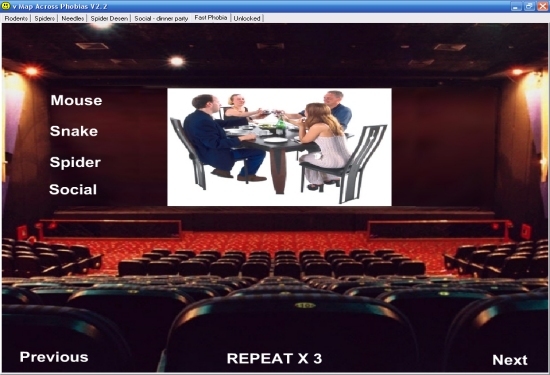 Fast Phobia Technique: The fast phobia technique AKA the "Fast Phobia Cure" involves imagining sitting in a cinema theatre and seeing yourself up on the cinema screen just before having the old reaction to the phobic stimuli, you are then guided up to the projection booth of the cinema. From the projection booth you are asked to play the process of dealing with the feared thing from beginning to end as a black and white move. When at the end of the movie you are asked to jump inside the movie and fast rewind in full colour. Instructions are communicated textually and via a recorded voice. You can select images that cover rodent (mouse) phobia, social phobia (dinner table), snake phobia and spider phobia. Images are in black and white or colour as required by the technique. Language categories defined to date are Arabic, Bengali, Bulgarian, Catalan, Chinese Simplified, Chinese Traditional, Croatian, Czech, Danish, Dutch, English UK, English US, English, Filipino, Finnish, French, (German-completed), Greek, Gujarat, Hebrew, Hindi, Hungarian, Indonesian, Italian, Japanese, Kannada, Korean, Latvian, Lithuanian, Malay, Malayalam, Marathi, Norwegian, Oriya, Persian, Polish, Portuguese Brazil, Portuguese Portugal, Romanian, Russian, Serbian, Slovak, Slovenian, Spanish, Swedish, Tamil, Telugu, Thai, Turkish, Ukrainian and Vietnamese. Other categories can be added on request. 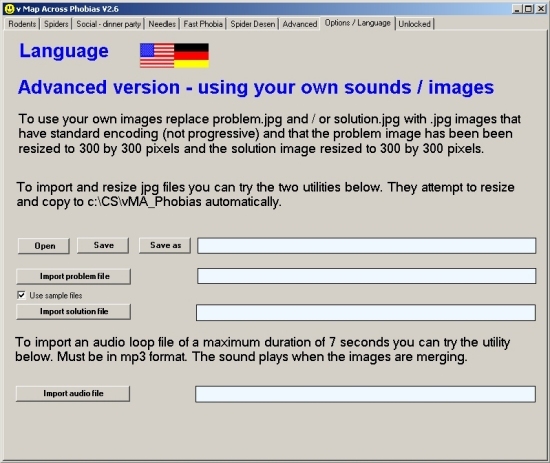 The software can be used on XP/Vista/Windows 7 Netbooks. As of Mar 06 MAC specific version available. (Does not include social phobia module or the free spider desensitisation or the fast phobia technique modules or the generic module, available with English language support only). The Mac versions are simpler than their PC equivalents and consist of a variety of individual files. 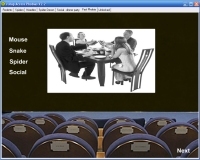 In the PC version an overall application allows instant access to each of the individual files within each product. The Mac versions are based on the first release of each product. Updates after version 1.0 therefore may not be available in the Mac equivalents. Images in good quality uncompressed jpg format in a zip file showing all aspects of two commercial flights. Available as an additional instant download. Images in good quality uncompressed jpg format in a zip file showing a 4th floor hotel balcony view and a high spiral staircase from the 5th floor of the same hotel. Available as an additional instant download. How to use the Map Across / Fast Phobia software utility? It may also be useful with the treatment of panic attacks / agoraphobia, the treatment of phobias and fears generically, the treatment of addictions and habits and in the treatment of trauma / PTSD.